Wild Idaho Rising Tide (WIRT) is hosting a know-your-rights (KYR) training workshop presented by Dana Johnson, a public interest attorney, wildlands, wildlife, and megaload activist defender, and Civil Liberties Defense Center (CLDC) board secretary. 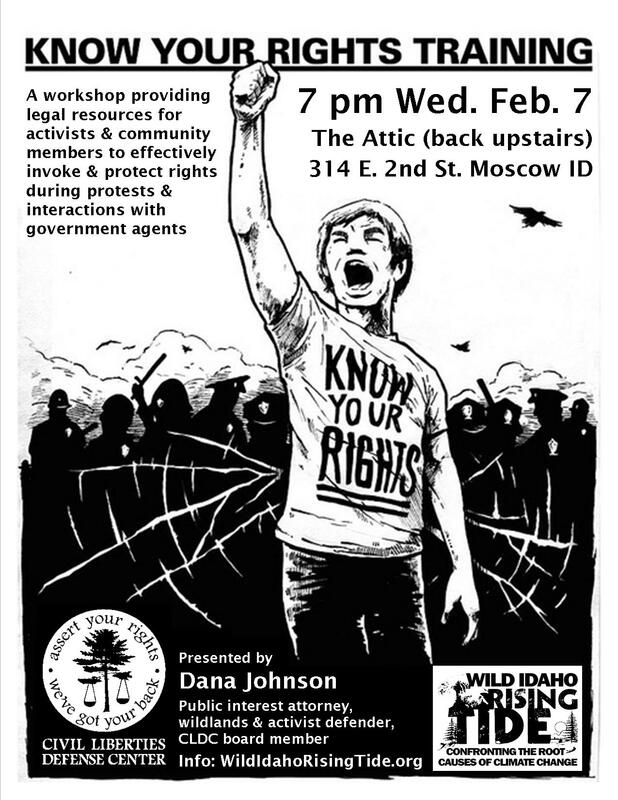 At 7 pm on Wednesday, February 7, at The Attic, up the back stairs of 314 East Second Street in Moscow, Idaho, the free talk provides legal resources for activists and community members, to effectively invoke and protect their rights during demonstrations and interactions with government agents. Event organizers welcome donations for training and travel costs, and appreciate the input of everyone who can attend the workshop and the following, first-Wednesday, monthly, Moscow, WIRT meeting. “Realizing that social and environmental justice often demand a firm challenge to the status quo,” Dana has previously given know-your-rights sessions in Moscow, as part of the October 2015 Idaho Flood the System Trainings and the initial, January 2011 gathering of 50 citizens who catalyzed WIRT inception, concerned about regional, tar sands megaload onslaughts [1-3]. Her north Idaho legal practice offers groups and activists creative, legal analysis, representation, and federal litigation in protection of the northern Rockies Big Wild, including legal observer coordination and activist education and support services. The indigenous, grassroots, and climate justice movements have expanded across the Northwest and the continent over the last decade, as the extreme energy/fossil fuel industry and facilitating governments have rampaged common lands and civil liberties, violating the constitutional and treaty rights of frontline activists and communities. 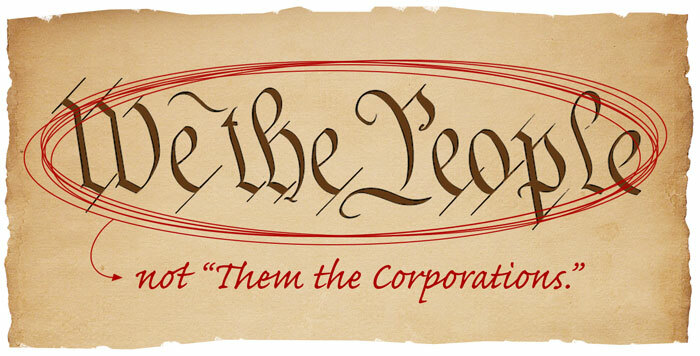 As environmental, social, and political strife intensifies in the United States and around the world, and asserting rights becomes imperative, the surge of activists filling roads, rails, and rivers with resistance demands their greater understanding “of the historical and ongoing threats to the safety and security of the broader, activist community,” from corporations, governments, and other institutions attempting repression . Activists should move beyond specific issues and focus on the big picture if they hope to retain the ability to shape the nature of their own communities, a Spokane-based community organizer said on Saturday in Moscow. “In a very real way, we don’t have a fracking problem, we don’t have a (genetically modified organism) problem, and we don’t have a local economy problem – we have a democracy problem,” Kai Huschke said. Huschke, an organizer with the Community Environmental Legal Defense Fund (CELDF), said communities can’t necessarily expect the existing regulatory system to work in their favor when it comes to corporate interests. 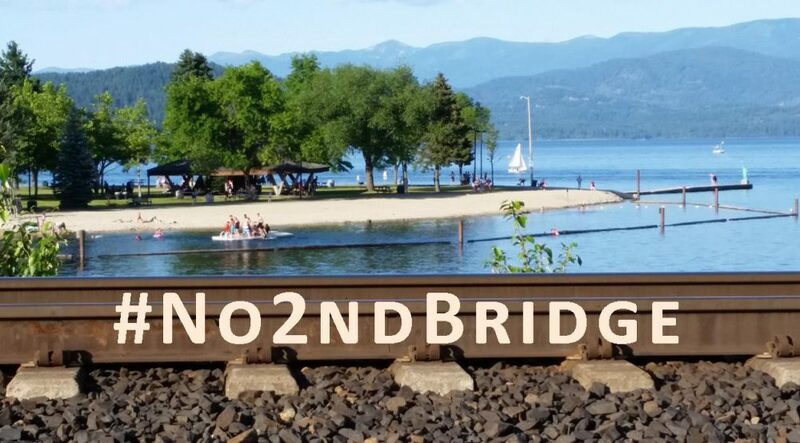 Without public consent, how can officials “permit” industrial processes and pollution that destroy pristine land, clean water, and shared infrastructure? Democracy Schools offered by the Community Environmental Legal Defense Fund (CELDF) examine how the American constitution has been reinterpreted and laws enacted to shift power from real people to “corporate persons.” Learn why large businesses have gained and seemingly possess more civil rights than the communities they overrule and impact, which often lack the authority to reject unfavorable development projects. Discover how people from Maine to Washington are working through their municipal governments to legally enforce economic and environmental sustainability. Explore next steps for passing city or county laws to expand protections for people and places, lives and livelihoods. 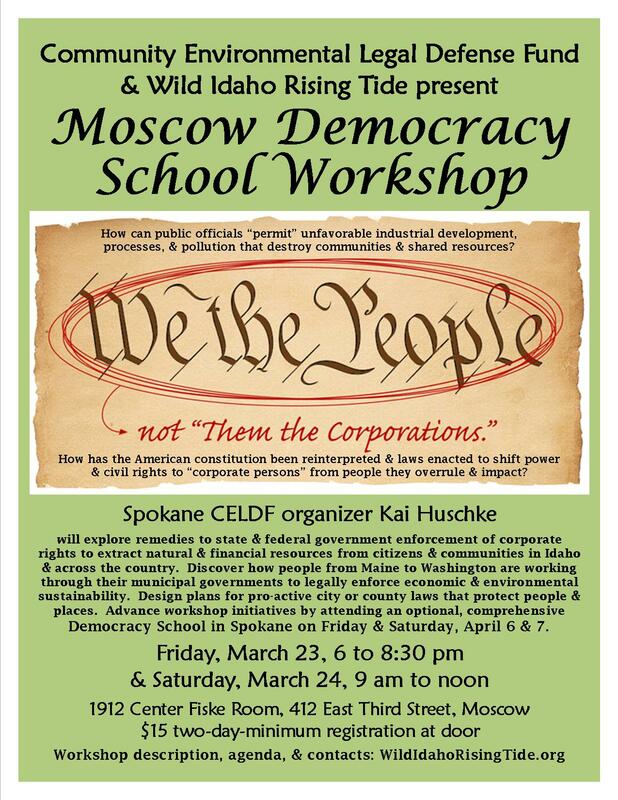 Organizer Kai Huschke of CELDF in Spokane will lead the Moscow Democracy School Workshop discussing remedies to state and federal government enforcement of corporate rights to extract natural and financial resources from citizens and communities in Idaho and across the country. Please RSVP and register to participate in this timely, pro-active seminar held in the 1912 Center Fiske Room at 412 East Third Street in Moscow between 6:00 and 8:30 pm on Friday, March 23, and from 9 am until noon on Saturday, March 24. To cover presenter work, travel, venue, and materials costs, we are requesting a $15 registration donation upon arrival for the entire two-day-minimum session. Similar to workshops provided in Bellingham, Washington, where an anti-coal export train initiative has emerged, and in Washington County, Idaho, where strong natural gas facility regulations have developed, further descriptions and the Two-Day Democracy School Agenda for the Moscow Democracy School Workshop are available on the Wild Idaho Rising Tide and CELDF websites. Kai encourages participants who would like to further lead the campaigns that arise from the Moscow workshop to attend the more comprehensive Democracy School in Spokane on Friday and Saturday, April 6 and 7. Listen to Wild Idaho Rising Tide’s Climate Justice Forum on Monday night, February 6, between 7:30 and 9 pm PST on KRFP Radio Free Moscow. Washington County anti-fracking activist Amanda Buchanan and Community Environmental Legal Defense Fund organizer Kai Huschke will update us on developments in state and county oil and natural gas rules, bills, and ordinances. Joann Muneta will discuss Moscow Farmers Market tabling changes, and show host Helen Yost will address the costs of Idaho megaloads and upcoming Moscow protests and fracking documentaries, forums, and petitions.